We spent our second week in Malaysia on the island of Borneo. We stayed at Basaga Holiday Residences, in Kuching, for the first 4 nights. Basaga used to be a school, but now was done up so nice you didn’t even know you were in a city. We loved staying at Basaga, because when the heat and humidity got to us, we could always cool off in the pool. The interior courtyard was surrounded with lush vegetation, and decorated nicely for Christmas. Given that the food at Basaga was quite good, particularly at dinner, and that the pool was right there, we didn’t get out to eat as much as Anthony would have liked. We still tried quite a few Malaysian dishes, including partaking in the Malaysian tradition of eating what we would consider to be lunch or dinner food at breakfast, such as Bee Hoon (a rice vermicelli dish), mee goreng (not spicy noodle dish), and mee mamak (spicy noodle dish). We each got to pick something we wanted to do. Amy just wanted to stay at Basaga and go swimming; Anthony wanted to explore the city; Hannah wanted to go to Jong’s Crocodile Farm & Zoo as well as the Sarawak Cultural Village; and I wanted to go to Bako National Park. Some of our picks worked out better than others. In the city, the girls enjoyed the Chinese History Museum, but didn’t like the humidity, so just wanted to get back to the hotel. 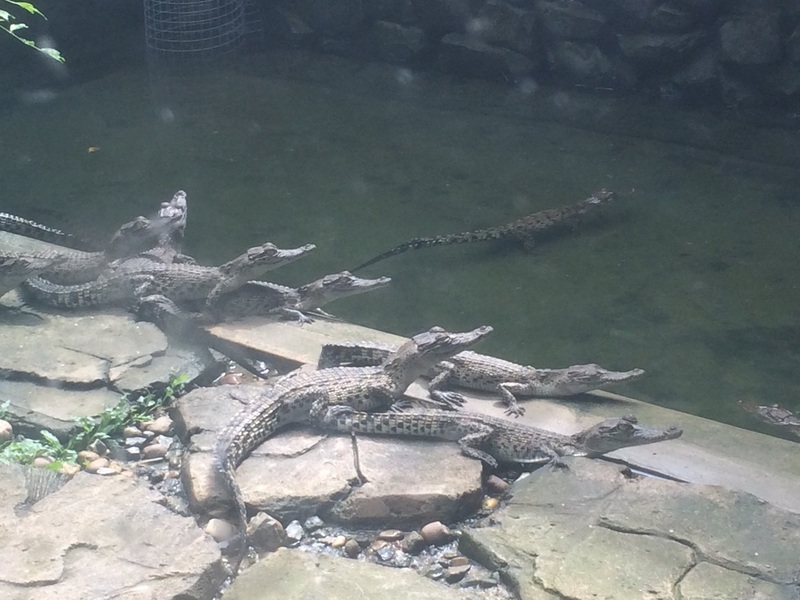 Same thing with the Crocodile farm…too humid. 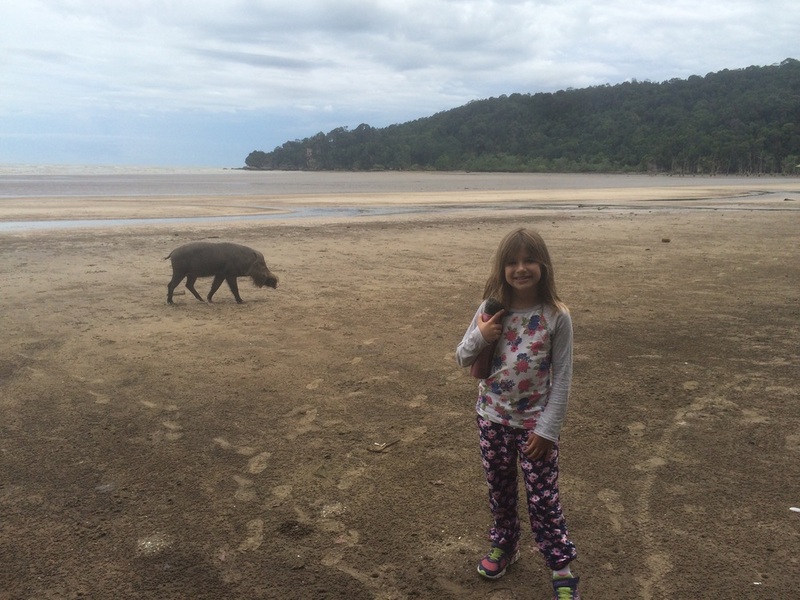 While it was also humid at Bako National Park, the girls enjoyed the boat ride there and back, and exploring the beach we hiked to. It was our lucky day as within the first 30 minutes, we saw lots of silver leaf monkeys, a bearded pig, a green viper snake and the proboscis monkeys. Our hike took us through a mangrove at low tide. We saw blue crabs, one-clawed crabs, and hiked through rocks and over lots of tree roots. The girls did really well on it and definitely prefer this to walking along a boardwalk or a sidewalk. At the Sarawak Cultural Village, we saw traditional houses of the various Malay tribes, as well as a Chinese farm house and Muslim house. We got a break from the humidity during the 45 minute cultural performance in the air conditioned theatre. The girls liked the performance by the hunter who used his blowpipe to pop balloons. After Kuching, we stayed 4 nights at Gunung Mulu National Park, a World Heritage Site. Even though there was no pool, it was fascinating to stay right in the rain forest and I’m glad we did it. Who knew the rainforest could be so loud at night! The first night we could here barking sounds, but knew there were no dogs in the park. The next day, we found out that they were barking frogs (at least that’s what the locals call them). We saw butterflies of different colors and sizes, swiftlets, a flying gecko, walking fluff, three types of millipedes and of course the bats that Mulu is famous for. We didn’t have to worry about Mosquitos in Mulu because the bats ate them. Our first tour was of the Fast Lane Cave. After a 15 minute longboat ride and a 15 minute trek through the park, we arrived at the cave entrance. This cave was amazing in that it was not lit up, took us an hour to walk through it was so long, and had blue racer snakes, blind white crabs, sticky worms (same species as the glow worms, but they don’t need to glow to attract food as there is enough food in the cave.) and a few bats in it. The next morning, I decided to hike to Paku Waterfall by myself, since the girls didn’t want to go. It was about a 30 minute walk on a boardwalk, followed by 30 minutes through the muddy rainforest trail to the waterfall. The waterfall is not that big, but you can go swimming at the bottom. I decided not to swim though. In the afternoon, we went to the Deer and Lang caves. We had to walk for one hour along the boardwalk to get there, so the girls were grumbling and Anthony had to carry them at various points. The Deer Cave has millions of bats (13 species), which makes for a lot of bat waste and one very stinky cave. The Deer Cave is quite high and wide – cavernous for lack of a better word. The Lang Cave, on the other hand, is small, has few bats, and is full of stalactites and stalagmites. The guide told us to use our imagination to see different things in the rocks. Hannah take her at her word, telling us what she saw in each and every formation! After the caves, we stayed to watch the bat exodus. It was nightfall by the time we got back, so we saw some fireflies along the way back. Mulu has a limited number of tourists it can accommodate, and we came in the low season, so it was nice to have the park mostly to ourselves. 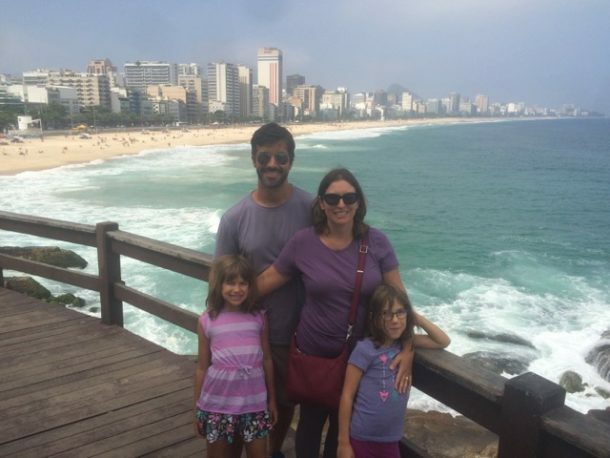 Our first two tours ended up being private tours, and we got to know some of the other people. Kuching and Mulu don’t quite get monsoon rains, just slightly more rain then the rest of the year. We ended up having beautiful weather, and even though it rained some of the time, it generally didn’t interfere with the activities we wanted to do. I hope the same trend continues for our time in the Sabah state of Malaysian Borneo. 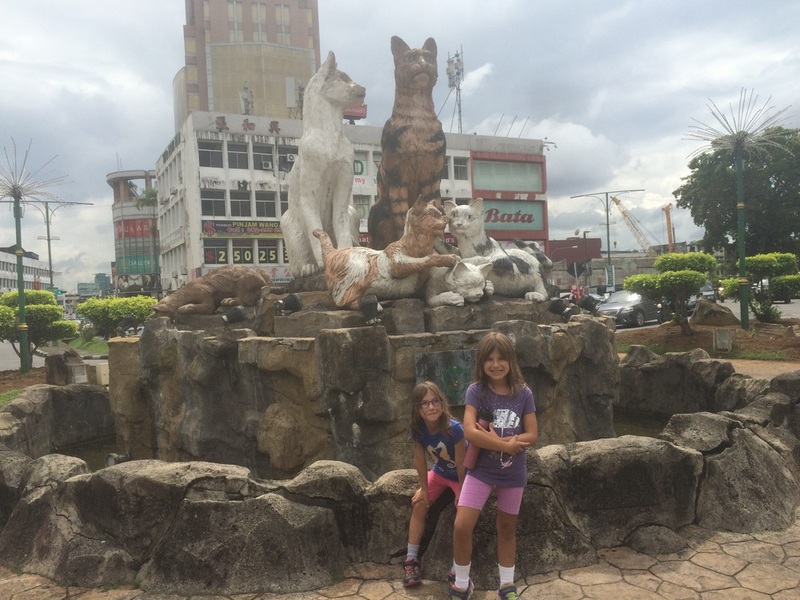 Hannah & Amy in front of one of the many cat statutes in Kuching. They breed crocodiles here and have some other animals as well. Chinese tourists would throw coins on the turtle, believing it was good luck. Bearded pig scrounging for food at low tide. The boat brought us to this point and the entrance to the park was not much further.